Antique - Imperial Glass of Ohio, Carnival Glass, Heavy Pressed Grape-Marigold Pattern, Round Bowl, Circa 1907-1925. A beautiful Antique, Heavy Round Carnival Glass Bowl in the Heavy Grape and Marigold Pattern. 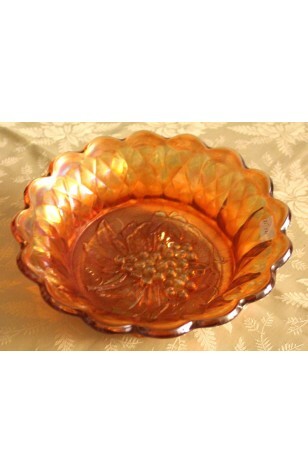 This is a Highly Pressed Grape Pattern in the Orange-Gold Color of Carnival Glass. Can be used as a Centerpiece, or a Fruit or Salad Bowl, etc. Great Condition with little to no wear or imperfections. Lovely addition to any collection of Carnival Glass. Priced individually, select the quantity you would like.